The next Planning Commission meeting is being held on April 27th at 7:00 p.m. If you are interested in a specific topic, please visit the Boards and Committees page for more information. The next meeting of the York Area Metropolitan Planning Organization (YAMPO) will be held on April 23rd at 9:00 a.m. located at the York County 911 Center. For more information, please visits the Boards and Committees page on our website. "Stormwater - Save the Date"
May 20th for the 2nd Stormwater Authority Feasibility Study Public meeting. Place TBD. Time is 4:00-6:30. The US Department of Agriculture recently released a report focusing on family farms in the US. The YCPC has prepared a Growth Trends report to present information on family farms in Pennsylvania. For the full article click here. The York County Planning Commission partnered with the York County Parks Department to produce new maps that are posted throughout Rocky Ridge County Park. The Rocky Ridge map currently shows the park boundary with shaded relief, points of interest and elevation profiles for each trail. Since Rocky Ridge is known for its excellent biking/hiking trail system, this map highlights these features to make it easy for the public to envision the level of difficulty and see the distance prior to even setting foot in the trail. These maps are posted at kiosks throughout the Park. 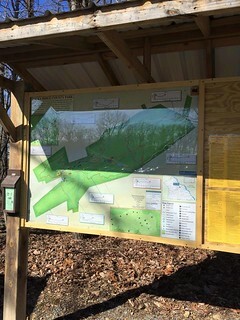 Similar maps of William Kain County Park have been posted in the kiosks within that park. The Planning Commission will continue to work with the Parks Department to produce similar maps for the other County Parks. Susquehanna Riverlands Conservation Landscape Summit to be held on Friday, May 1st at the Columbia Borough Trail Services Building. Summit Meeting is from 9:00 am to 12:00 pm. The event is FREE but registration is required; Registration deadline is April 27th. See attachment for more information. Harrisburg, PA - As part of the update to the commonwealth's Twelve Year Transportation Program, Pennsylvanians are invited to visit www.TalkPATransportation.com to provide input on their transportation priorities and to register for an interactive online public meeting on April 16. The program, which serves as a blueprint of prioritized transportation projects, is updated every two years through a cooperative effort among the State Transportation Commission (STC), PennDOT and its 24 regional planning partners. The goal is to enable all Pennsylvanians to contribute their priorities and suggestions. The online public meeting will be held from 7:00 PM to 8:00 PM on Thursday, April 16. During the live Webcast, Richards will provide an update on the state's recently released Transportation Performance Report and the public comment period. Richards and other PennDOT staff will also answer questions submitted before and during the meeting. Pennsylvanians must register to participate and can do so at www.TalkPATransportation.com. Questions may be submitted in advance to ra-penndotstc@pa.gov and participants may also submit questions during the meeting through the Webcast tool. By taking the public survey once it is posted on the website on April 16.